For years I've been adoring the work of artist Marleen Felius. Her work - main topic: cows and cattle - is known and valued all over the world. 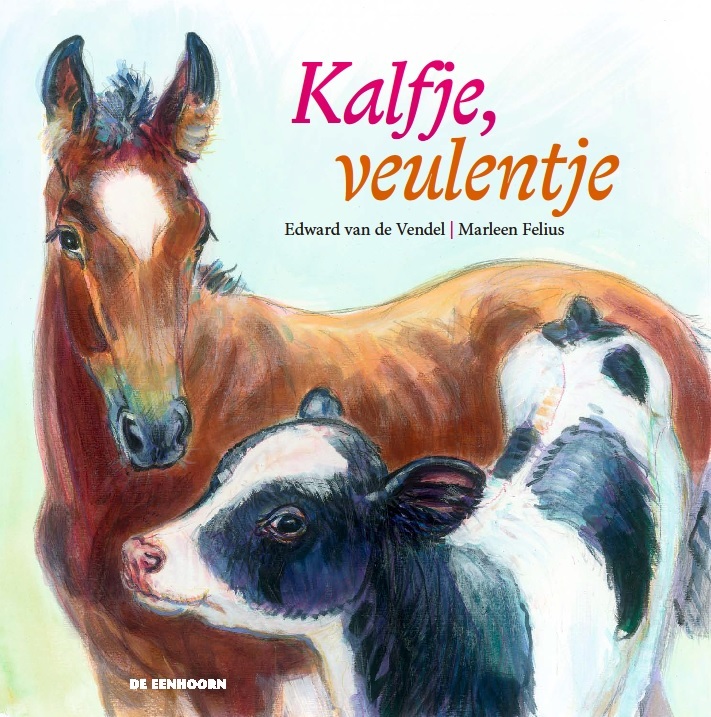 Her 'Cattle breeds encyclopedia' (text and images by Marleen) is a magnificent work of art and knowledge. Finally we found a chance and the time to work together. The result of this is the sweet and lifelike LITTLE CALF, LITTLE FOAL. Which is out now! This book has a very, very simple text, which talks about the first hours and days of a newborn calf and those of a newborn foal. The pictures show it all: the first drinking, the standing-up, the first time they see the meadow. It's almost non-fictional (because, when Marleen Felius is involved, you know that everything is true to life and no mistakes are made! ), but still a small story. Thanks to publishing house De Eenhoorn and designer Dries Desseyn. A proof translation in English is available, and this is the foreign rights page of De Eenhoorn.